One of Derby’s greatest, and often overlooked hidden gems. Today, the Market Hall is a bustling mix of eclectic stalls – many of which have been a firm favourite with shoppers for generations. The Market Hall is particularly well known for offering a wide range of fresh local produce. 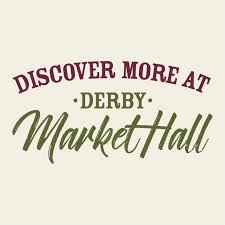 The wide range of meat, fish and vegetables have been joined more recently by speciality stalls with a wide choice of fashions, accessories, homewares, craft items and jigsaws – to name a few. This grade II listed building was a project by Melbourne engineer, Rowland Mason Ordish in 1866. He is noted for the Albert Bridge, London 1873 and the dome of the Albert Hall. His detailed work on the single spanned roof of St Pancras Station, London (with William Barlow) has a comparable splendour to the roof of the Market Hall.